The insightful blogger who goes by the moniker Spotted Toad has created a series of charts explaining the 2016 Electoral College results as a result of average home price in each state. Here is Spotted Toad’s graph showing the fifty states, with Trump’s share of the vote on the vertical axis and home values on the horizontal axis. 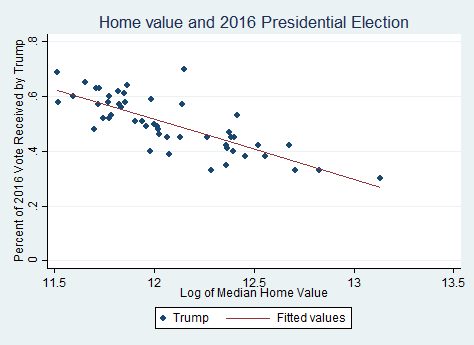 The correlation coefficient for the relationship between Trump’s share of the vote and home values in each state was –0.76, a very strong negative correlation.